Over the past few months, many bars have closed and opened in Hoboken. One such opening/closing was the shuttering of Hoboken’s only gay bar “The Cage” and the opening of Havana Café & Lounge in its place. 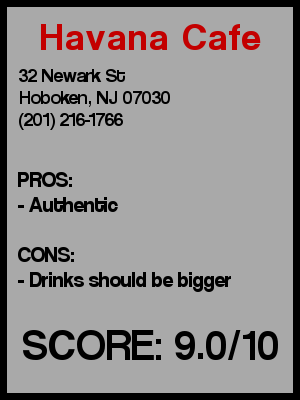 While I was slightly upset that one of Hoboken’s “different” bars closed down, the new Havana Café & Lounge is the perfect addition the Hoboken bar scene. 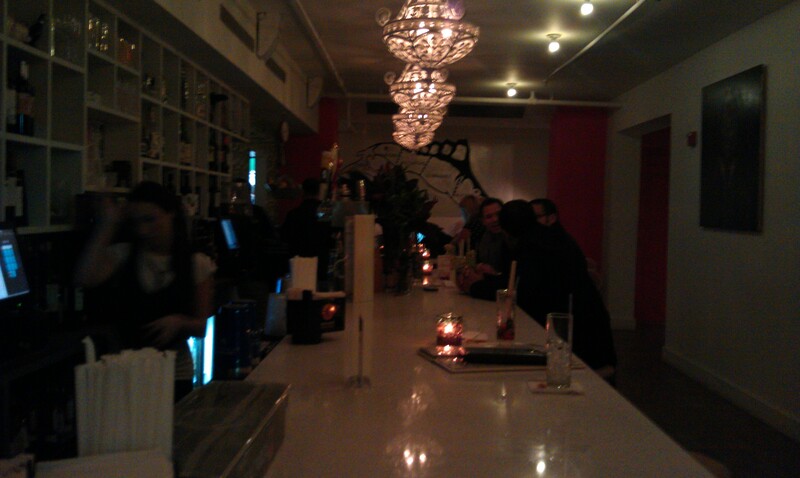 We walked into the sleek white bar located at 32 Newark Street (between River Street and Hudson Street) on a chilly evening. I don’t know if it was the music, the look, or the heat pumping in the bar, but we were instantly transported to Cuba. I had never been into The Cage while it was there, but I doubt it looked anything like Havana Café & Lounge. The bar is clean, simple and very white. The whole motif of white and light wood really makes you feel like you are sitting on the beach in Cuba (although I am pretty sure no one reading this has ever been to Cuba). 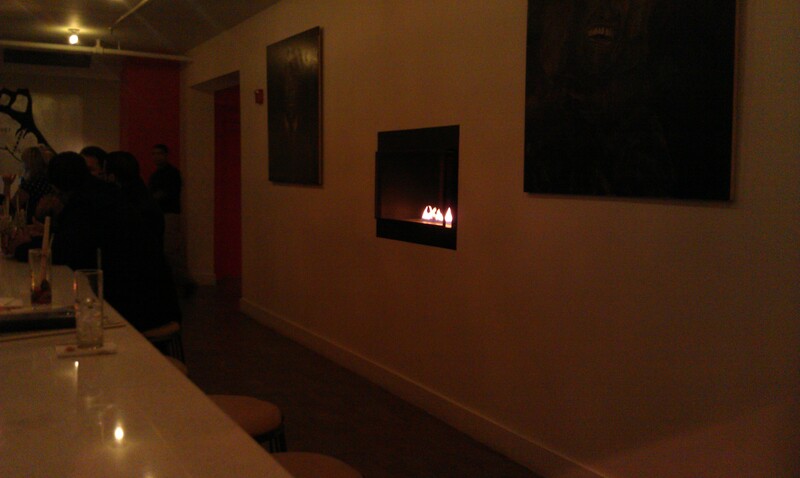 Lights hang down from the bar, there is an in-wall fireplace in the wall separating the restaurant from the bar area. The bar stools are comfortably cushioned and felt like you were at some vacation resort. All of the tunes have a Latin/Cuban beat, and there was definitely a good amount of Spanish being spoken between customers and staff. We took a seat at the bar and took a look at the drink menu. Havana Café & Lounge carries about 13 different mojitos, a few Cuban inspired vodka drinks, and even bottle service for those looking for the lounge experience. Although there are no prices listed for the mojitos and specialty, I’ll spoil the surprise and let you know that they are $8 each. There are plenty of fun mojitos such as Mango, Coconut, Guava, Spearmint Citrus, etc. 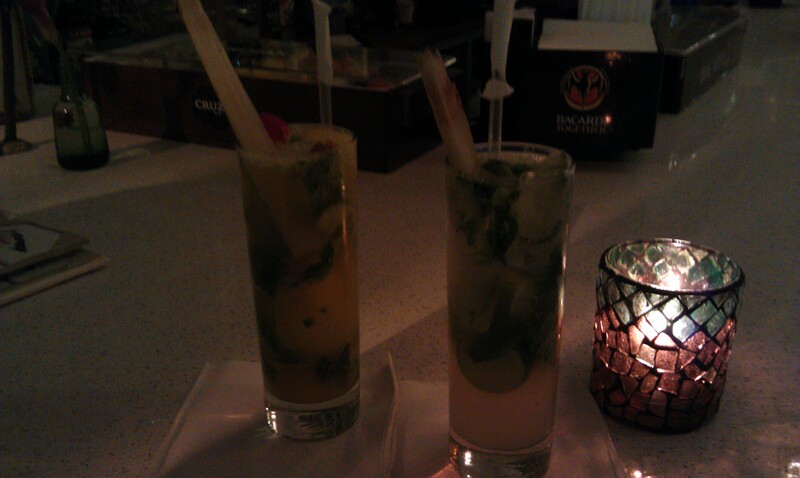 I went with a traditional mojito and my date had a Mango one. All of their drinks are handmade, which much be a pain for the bartenders, but they make them with a smile. They toss in a pineapple husk (is that even the term?) for good measure and serve the drinks in a narrow tall glass. The drinks were tasty if not too filling considering all of the physical ingredients that they throw in there. After having one mojito I switched to a Lemon Ice Tango vodka drink which used citrus vodka, sour mix, club soda, and lemon to make a very sour, yet delicious drink. For those beer drinkers out there they have Hoegaarden, Bass and a few others on tap…but you should treat yourself in something that tastes like the atmosphere. All of a sudden Hoboken has become a hotbed for Cuban food. For years the Cuba restaurant La Isla has been only guy on the block serving authentic Cuban food, but I guess the years of long lines and the Cuban population in Hudson County has made for a Cuban revolution in Hoboken. 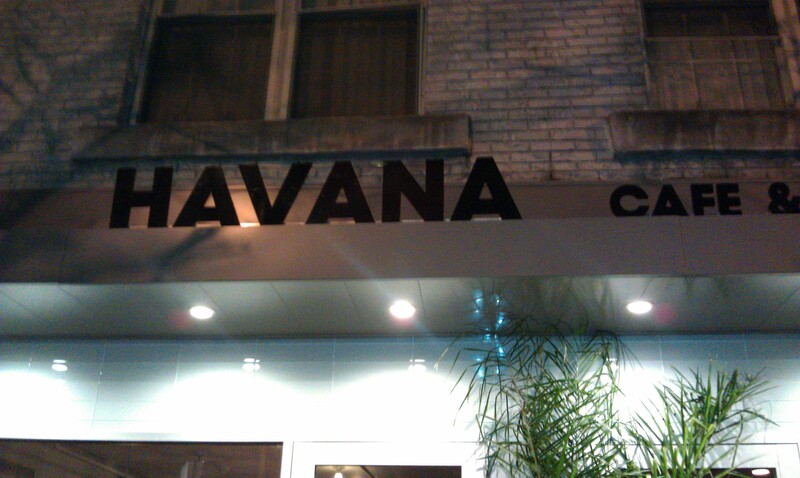 In the past few months Havana Café & Lounge and Calle 6 has opened with another Cuban place on the way in the old Nine. location on Washington Street. And all of them have added to the flavor of Hoboken. Being that Havana Café & Lounge is the only Cuban place that serves drinks and is open, the other ones you will have to experience on your own. Crowd stereotype – In the bar area everyone seemed in their late 20s young 30s. In the restaurant there were a few couples and a few families with young children. 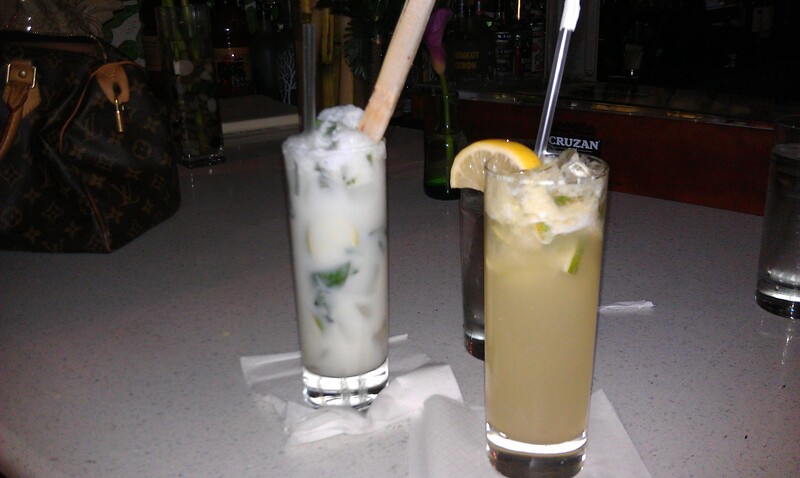 Value – Specialty drinks and mojitos were $8 which is fair, but I wish the mojitos were just a little bit bigger. Dance – Not while we were there, but maybe on a more packed night. First or last drink of the night – Maybe a good first drink place. 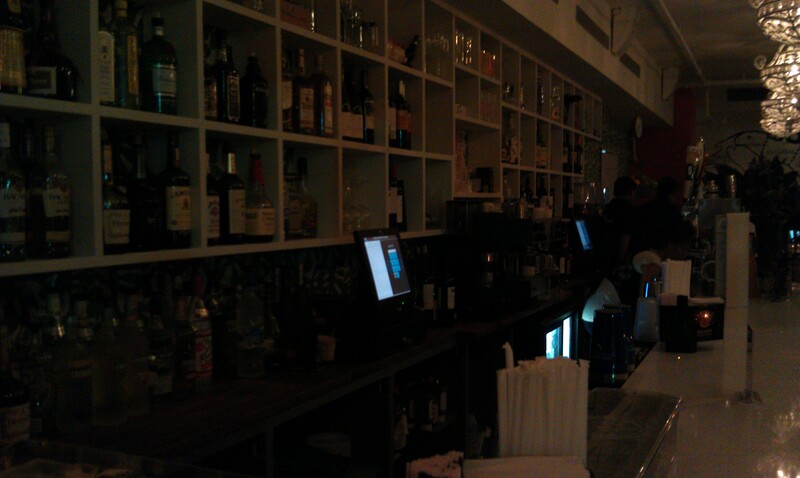 Overall - The owners did an amazing job transforming this place into a Little Cuba. Hoenstly I can’t see one thing they overlooked in making Havana Café & Lounge into the Cuban experience we all invisioned. From the clean white & wood look to the mural on the wall of a Marlin in the shape of the island, every detail is done exceptionally well. The drinks are tasty, but a little small, but there are plenty of fun drinks to choose from. I would highly recommend popping inside during the upcoming cold months. You get all of the flavor of an island at much less the cost of a full vacation. I’ll give it an 9.0.